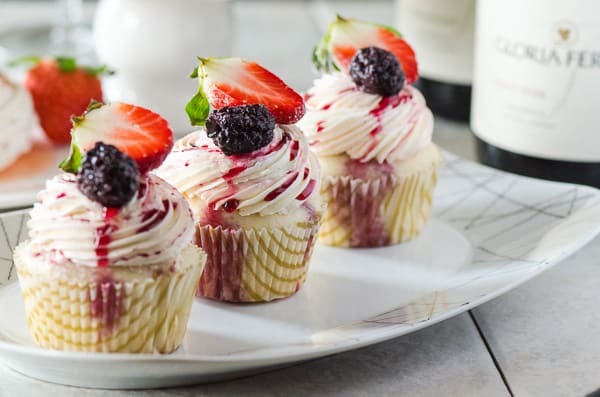 These fluffy Vanilla Cupcakes are overflowing with a sweet-tart red wine berry filling, and topped with a berry Italian meringue buttercream – a perfect spring dessert! Have you ever seen a food pic on Pinterest or Facebook and instantly wished you had that particular food in your face at that very moment? 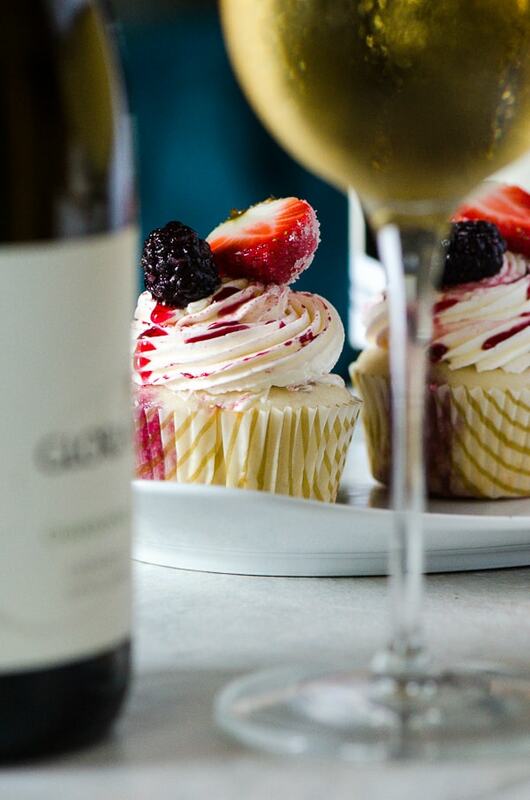 That’s exactly how I feel about these Vanilla Red Wine Berry Cupcakes. I only made a half batch for the purpose of this post, and they disappeared wayyyyy too quickly. Like…within the same day. Instant gratification is such an unfair concept. JUST TAKE ME TO THE VANILLA CUPCAKES ALREADY! 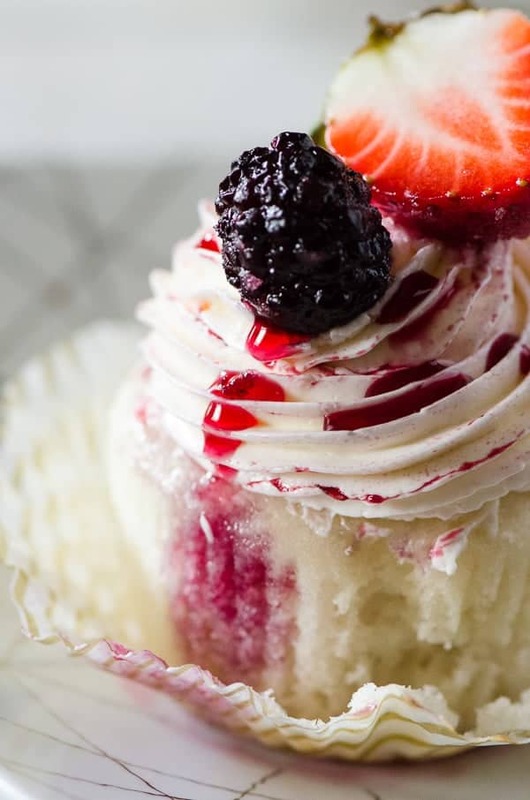 If you’d rather skip my (pretty darn helpful) tips and tricks, essential cooking info, and similar recipe ideas – and get straight to this deliciously easy vanilla cupcake recipe, just scroll right on down to the bottom of the page where you can find the printable recipe card! This is the joy for me. I love cupcakes. I now just manage it, so I don’t deny myself cupcakes. I have cupcakes every day. OK. That’s a complete exaggeration, courtesy of Oprah. I do, however, have a glass of wine almost every day. I’m not sure if that fits into any sort of weight loss program, but if someone out there is working on one and needs endorsements, I’m available. Reds are my go to. I got my feet wet in the wine world on sweet whites, but after finally opening myself up to trying darker, drier vino, I fell in love. Sweet wines are easier to drink, reds are more pleasant. 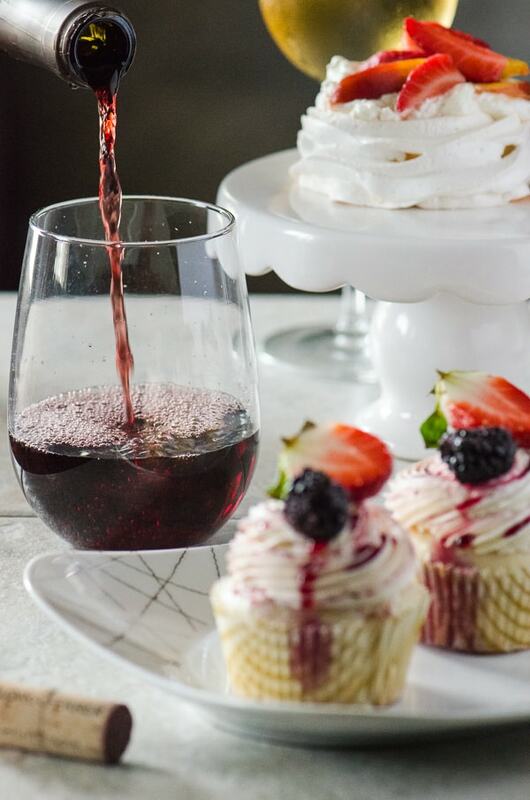 You can nurse a glass of Cabernet or Merlot over dinner, over dessert, or while you catch up on your favorite TV show. Plus, I think I read somewhere that red wine was heart healthy, so I’m banking on that for the future. So welcome, by the way, to part two of my love for Gloria Ferrer series! It’s not an official series, I just honestly couldn’t resist using both of the delightful varieties of wine they sent me to try in some sort of spring dessert. Most recipes that match red wine and berries are paired with chocolate, for obvious reasons: they are amazing together. 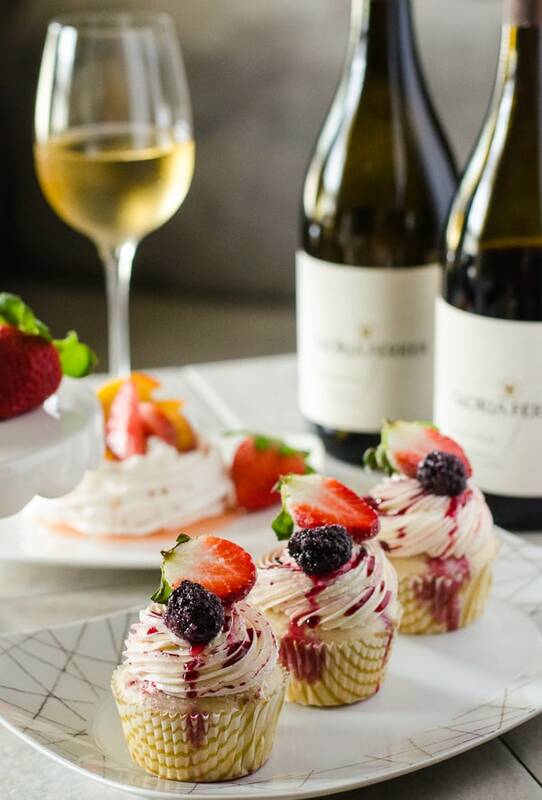 The Pinot Noir berry filling and sauce used in this recipe are a perfect match for the vanilla bean cupcakes and the rich yet light Italian Meringue Buttercream that crowns it all. 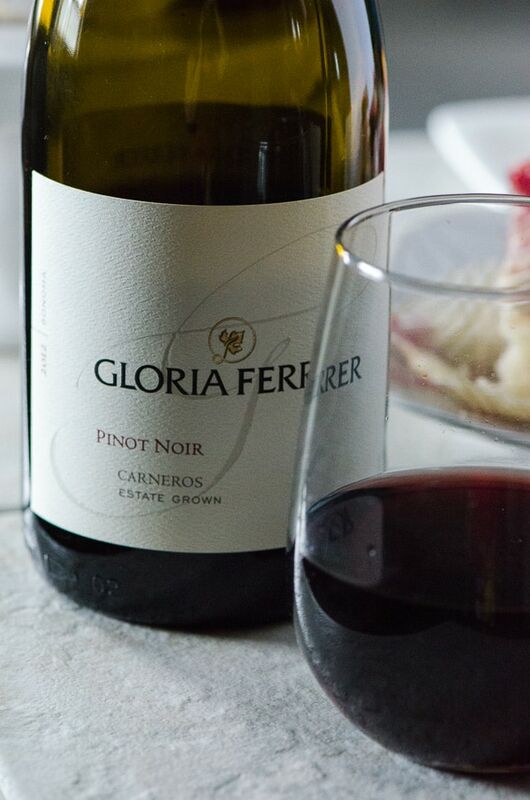 Gloria Ferrer’s Pinot is quite earthy, but emits aromas of black cherry, cedar, and spice with a smooth mouthfeel and long finish. If you’re looking for a wine to pair with pan-seared duck breast or a cheese plate, this is the one. 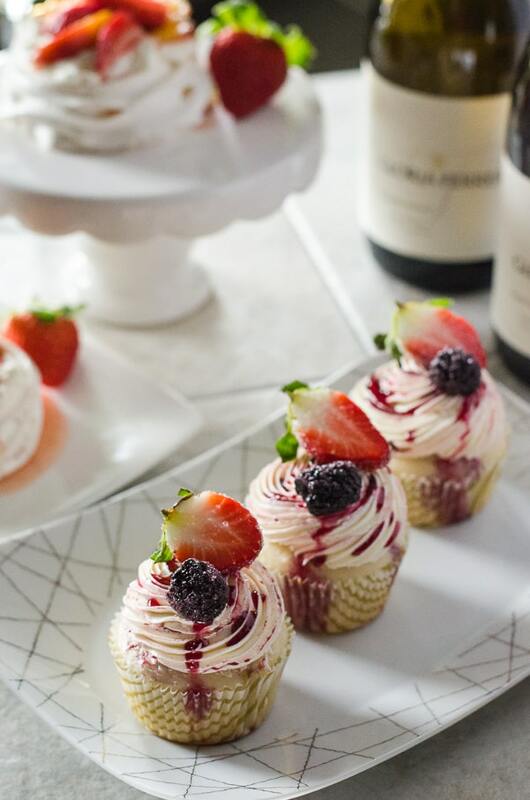 These fluffy Vanilla Cupcakes are overflowing with a sweet-tart red wine berry filling, and topped with a berry Italian meringue buttercream - a perfect spring dessert! Preheat oven to 350 degrees F. Line 2 standard cupcake pans with 18 liners, spraying them lightly with cooking spray; set aside. In a large bowl, combine melted butter and sugar. Mix together on medium speed for 2 minutes until thickened. Add eggs one at a time, mixing until blended between each one. Add vanilla and blend well. Add the buttermilk and flour mixture in alternate additions, beginning and ending with flour. Mix until just combined - don't overmix. Bake for 15-20 minutes, checking at the 18-minute mark for doneness. They should be a nice golden color and leave nothing on a clean inserted toothpick. Remove from oven and allow to cool in pan for 10 minutes, then remove to cooling rack. Combine ingredients in a medium saucepan set over medium-high heat. Bring to a boil, then reduce heat and simmer 15 minutes until slightly reduced. Strain the berries using a fine mesh sieve, reserving both the liquid and berries. Place the berries in a separate bowl and add back 2-3 Tablespoons of the liquid, stirring to combine. Cool to room temperature. Prepare Italian Meringue Buttercream while cupcakes are cooling. 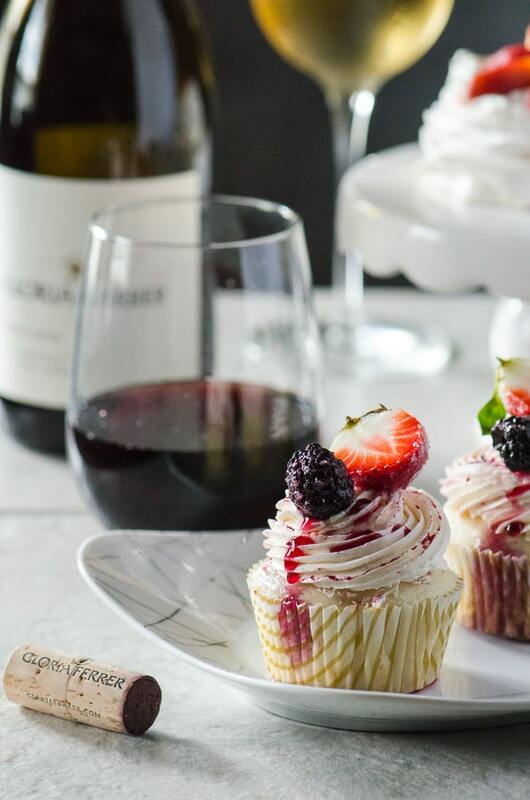 When ready to decorate, use a cupcake corer or small knife to hollow out the middle of each cupcake. Fill each cupcake with 1-2 Tablespoons berry filling. Stripe a piping bag with thin stripes of remaining berry filling, then spoon in Italian Meringue Buttercream. Top each cupcake with icing. 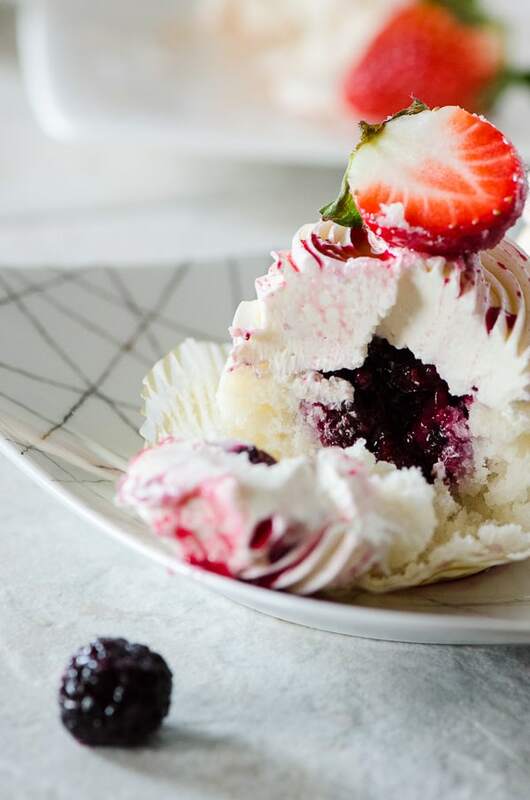 Garnish with fresh berries rolled in sugar, and drizzle some Red Wine Berry Sauce (the reserved liquid) on top. Enjoy! How do you like to incorporate wine into your recipes?